RIO DE JANEIRO – Starting Friday May 14th, The British School, Rio de Janeiro (Escola Britânica) hosted a Model United Nations (MUN) conference, with 300 students participating over the two days. For some of the participants, this event served as training for a conference to be held at Harvard University next year. Students participating in an MUN assembly at the British School, photo courtesy British School of Rio de Janeiro. The MUN is an event that school children ranging in ages from nine right through to final year students participate in around the world, although most conferences happen in the United States, where the Harvard format of the Model UN was developed for students in the early 1950s. 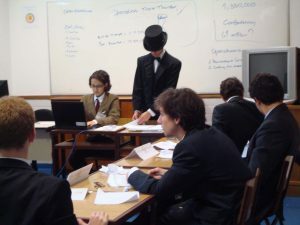 The idea is that children participate in an accurate simulation of the conference format used by the real UN, with groups of students assigned countries to represent. Prior to an MUN conference, these groups spend time preparing statements of position that reflect the real policies and interests of the countries they are representing. The simulation aspect is pervasive throughout the event, with the nation groups spending time in the various committees of the UN, debating the issues and working towards resolutions. Helping the students with the methodology of the United Nations is Dave Williams, Pastoral Director and Assistant Head Teacher at The British School, whose interest in current affairs first led him to get involved with the MUN eight years ago. He says that the learning curve is steep, especially for those children who are participating for the first time, and that one discipline he is constantly trying to instill is the need for the students to adopt the interests of the countries they are representing, even when that may run counter to their own values. Students in committee at the weekend's MUN. Photo courtesy British School of Rio de Janeiro. Some might regard organizations like the United Nations as ineffective and token; not surprising given the myriad of conflicting interests, and Williams says that it’s part of the experience for the children to get a taste of just how difficult it is to establish consensus among such disparity. Mr. Williams is also responsible for organizing The British School’s trip next year to Harvard University, the birthplace of the modern MUN, where there will be 3000 children participating over four days. Sofie Saboia is a Class 10 student who was extensively involved in last weekends event. Her group represented the Netherlands, and she also sat on the Human Rights council. Everything went smoothly she reports, although on the second day tempers flared a few times as participants tired. One issue her group debated was gender equality with a focus on prostitution, and in a possible reflection of the real thing, resolution was difficult to come by due to the objections of muslim nations Bahrain and Afghanistan. Poppy Wilks is another Class 10 student who wonders whether the real UN might learn a thing or two from their more youthful counterparts. Does she think British School students should be immediately dispatched to the Hague?